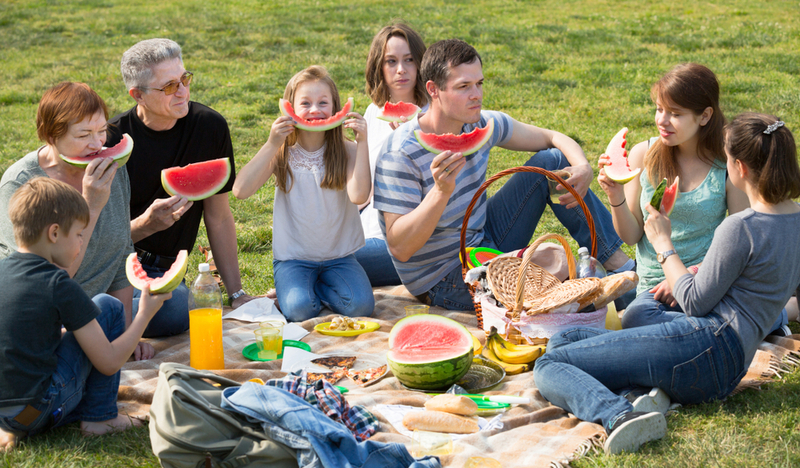 Picnics are one of the most enjoyable things you can do once the warmer weather arrives. Just you, your nearest and dearest, and a spread of delicious food! They’re a cheap and cheerful option for a day out, and the perfect addition to any camping trip or staycation. But what can you do to make your picnic even better? We’ve gathered together 8 innovative picnic ideas to take your next picnic to the next level, including some really delicious recipes! This is a really simple side dish to cook, and absolutely perfect for a picnic! Simply wrap individual spears of asparagus in bacon, and then bake in the oven for 20-25 mins at 200 degrees Celsius. To make sure the bacon gets nice and crispy, cut the bacon in half lengthways to make narrower strips of bacon to wrap around your asparagus spears and make sure the bacon strips overlap as little as possible. Flip the asparagus halfway through baking to make sure one side doesn’t cook more than the other! Once they’re cooked, dry the grease off with a paper towel and wrap in tin foil to keep them warm until you arrive at your picnic site! Quiche is a picnic favourite, as it is not only delicious hot, but just as good cold, too. Quiche lorraine is the go to quiche for many people, but to add a delicious twist on the classic, we love this recipe from Jamie Oliver which adds leeks to the mix. Leeks are such a simple addition, but they completely transform this dish and the flavours all work together perfectly. Chocolate covered strawberries are great, and definitely a picnic staple, but they do have a tendency to melt all over your hands as you try to eat them. An innovative solution is to make chocolate filled strawberries instead! These are a favourite on Pinterest and are super simple to make. They literally take about five minutes to prepare, and all you need is some chocolate and strawberries. Simply melt some chocolate, slice the tops off your strawberries and cut the core out, as well as a tiny bit off the bottom to make sure they stand upright. Then spoon in the chocolate, and either wait for them to set or pop them in the fridge. You could even sprinkle a little bit of sea salt on top of the chocolate for an added twist! Potato salad is definitely a staple picnic food that we all know and love, but it never hurts to switch things up a little, and we love this recipe for Bombay potato salad. Another one from Jamie Oliver, this side dish is full of colour and flavour. Vegetarian options can be a little bit boring when it comes to sandwiches, particularly if you always have the same few options presented to you in the shops. But we’ve found this delicious green hummus salad sandwich from Cookie and Kate and we think it would make the perfect sandwich for a picnic in the sun! Tomato Caprese is delicious and perfect for summer meals, and making it Hasselback potato style makes it perfect for eating al fresco, and thus a great addition to any picnic! This recipe from Tablespoon explains how to prepare it. Instead of taking ice packs to keep things cool, just freeze some bottles of water and use those instead. Then you’ll have nice refreshing cold water to drink once they’ve defrosted in the sun! Alternatively, you could pop some cans of beer or premixed spirits in the freezer instead if you’re having a grown-up picnic. This one may sound really strange, but bring a cheap shower curtain with you if your picnic blanket doesn’t have a waterproof underside! Pop the shower curtain underneath your picnic blanket to keep it dry and stop it from getting dirty. This means you can bring any blanket you want to your picnic without worrying about it being ruined! We hope this has given you some new ideas for your next picnic and some inspiration for when the warmer weather arrives soon. If you’re planning a camping trip or getaway for the springtime be sure to check out our lodges and campsites here at Pure Leisure.